The eternal questions… What can we expect in the afterlife? Can we communicate with loved ones in the spirit world? Can they communicate with us, watch over us? Darcy Bellows-Mascorro delves dramatically into uncovering the answers in Finding Vern, a memoir of her relationship with Vern Mascorro, before and after his death. 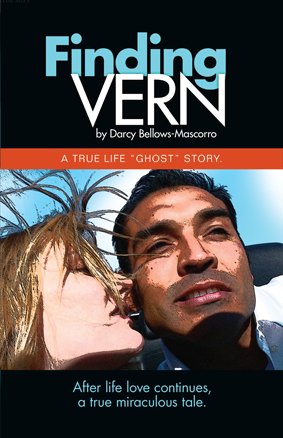 Darcy was driven by Vern’s sudden passing to learn if his energy and memories transcended his body’s death, if she could find evidence that he lived on in spirit. Darcy worked with several mediums who she believed provided evidence of contacting Vern’s higher consciousness. Her book encourages everyone to be open to receiving an experience with their loved ones from the other side. She affirms, with certainty, that if you look, are open, and are in need, you will receive signs. In her readings with mediums and her recognition of signs, Darcy writes that she received nothing but comfort and healing messages of love. Darcy offers her “evidence” that the soul, our essence, is infinite and that we never really lose our connection to the people we love. Vern communicates to Darcy that she can pull the veil back, learn to connect with him, herself, without mediums, and teach others how to as well. 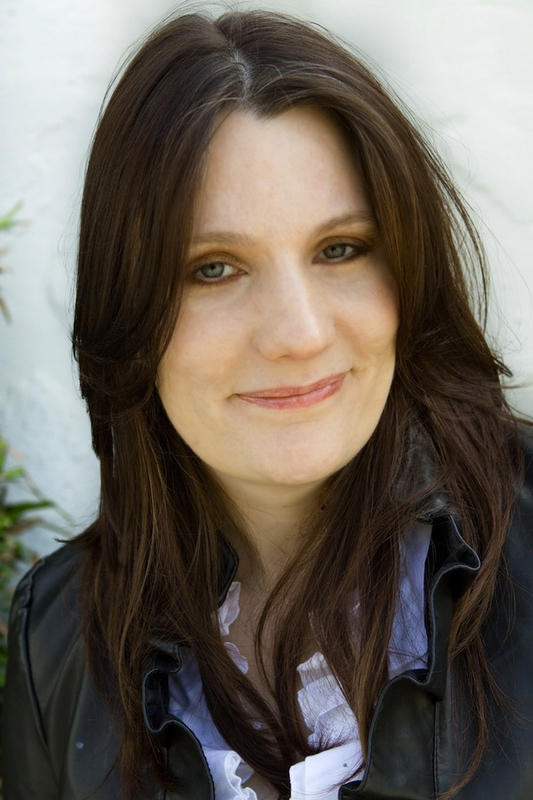 Here, Darcy Bellows-Mascorro answers the many questions I had after reading her true life “ghost” story. BECCA: What hope or message do you wish to offer others with your book? DARCY: We are eternal beings. Death is not the final chapter in our lives or our relationships. We don’t have to fear death. We have choices and free will and that continues when we leave our physical body. We can communicate across dimensions and we will one day join our loved ones on what is coined the ‘other side’. I learned through my loss and then discovery that we are spiritual beings having a physical experience; that this life is but one chapter in the saga. I never really believed this until I had reason to investigate that possibility for myself. I learned that, while here incarnate we can experience a piece of what we term ‘heaven’ if we open ourselves to the mysteries. I now understand all things are possible; it is only attitude or thought that limits the possibilities. BECCA: What were the most important things you learned about the afterlife during your journey to find Vern after his death? Did they correlate with what you learned from studying world religions? DARCY: All world religions describe a loving place for the righteous to go and a loving God/Source to receive them in some way and then judgment to ensue with reward or punishment. This is partially right. The love part is right, the judgment part is wrong. I have learned that at the point of physical death, we enter into spirit and we feel an absence of all earthly fears, no pain, there is just a feeling of love and security. We are met by loved ones to help with the transition, we are given options: the option to be shown a life review, the option of what to do next. Heaven is not a place governed by a self-indulgent, egotistical, all-knowing, vengeful judge that commands strict obedience and control. In fact, I have heard no evidence of this. This is all good news. The afterlife is not unlike earth minus the struggle of the material; there is free will. The ‘punishment’ for your misdeeds, should you decide not to confront them is being stuck in a state some call stagnation death. BECCA: I especially liked your suggestion on how people can truly comfort others who are grieving – could you expand on this topic? DARCY: It’s important we neither ostracize nor smother the grieving. Be sensitive, kind and understanding. Be a good listener, be OK with silence. Look for opportunities to help them out of their shell. Don’t try to brush away the grief and have them ‘move on.’ People don’t move on from loving someone that dies. They learn how to deal with their new reality. Bring up wonderful memories and how lucky you feel to have been a part of their life in some way. People can be very uncomfortable dealing with the heaviness of grief; it is our job to bring light to those that need it. Memories of how their life have positively impacted yours can help a person feel open to talking about their feelings. Ultimately what helps the most is being able to talk and honor their loved ones and their feelings about them in their due time. BECCA: Do you have any suggestions on how others can contact loved ones who have passed? DARCY: There are hundreds of talented readers, but thousands that are not practiced enough to act as professional mediums. You can pretty readily select a medium that only does mediumship, but make sure to ask for references. I like the mediums that call themselves evidential because they understand how critical that is to the sitter and focus on that. Anyone willing to say I want to focus on proving that your loved one is here to you and myself is of integrity. You must suspend disbelief and be open for your reading but don’t ever tell your story because that will put the medium in the spot of using their mind, not hearing spirit. We all have the capability to receive messages but for the most part we are preoccupied with thought and our 5 senses and not tuning in to that spirit message or intuition. I really encourage people to tap into their own intuition – you will then get signs on your own. It’s not only beneficial to be intuitive for the purpose of connecting to spirit but it can help in everything. Have you ever gotten a bad vibe off someone, ignored it and been right about your initial read? Almost all of us have but we talk ourselves out of using that Sixth Sense. BECCA: Are you continuing to ‘lift the veil’ in communicating with Vern personally? Will there be a Volume 2? DARCY: I am continuing to study and I have received more mystical phenomena. I have so much to share I am bursting at the seams to begin writing volume two. I am having a little trouble with prioritization – I have so much I want to do but so little time as I am still carrying a full-time job. I also intend to make Finding Vern into a movie with a fresh twist; Vern and I are going to tell the story from his perspective. It is all exciting, and eventually I want to create a center for fellow spiritual explorers to come for a respite and some soulful expression. In the meantime, Vern continues to sends me signs. They come and go, directly related to my preoccupation with material thoughts. If work pettiness is wearing me down, I tend to not be able to tap in as readily. If I am able to keep problems in perspective I am much more successful in my spiritual endeavors. I am doing far fewer medium readings these days, so that I can connect to the other side proficiently for myself. I use readings now as a way to validate my own personal spiritual experiences and intuition. I am still in the mind quite a bit but at least I am getting far better at telling whether I am making it up or it’s coming from Vern or the Creator. I have also had a few out-of-body experiences and once you have had one, you know you aren’t making it up. They feel as real as a day in the life of, and you can usually do things you can’t in the physical world, like fly. Now I just have to figure out how to do it less randomly and more at will. BECCA: What suggestions do you have to other first-time writers who feel they have an important message to share? DARCY: I suggest starting by journaling your ideas until something really inspires you; it’s free form without judgment and helps you bring form to concepts. Once you have a solid idea, write an outline. Next, join a local writer’s club/group as other writers are incredibly supportive. You can find groups on Meet-up or, if you live in a larger city, there is bound to be a writer’s organization which you can find by typing your city and the word writers into a search engine. I didn’t find my fellow writers until after the book was written, but I can say I could have probably shaved 2 years off the process if I had reached out sooner. Other writers help by giving you ideas and feedback as you develop the material. They also tell you the do’s and don’ts of the business and help you with Marketing. I now take online classes and take part in some online groups such as Facebook “Writers.” It really helps to be supported by other wonderful, creative people. Finding Vern is available on Amazon.com. 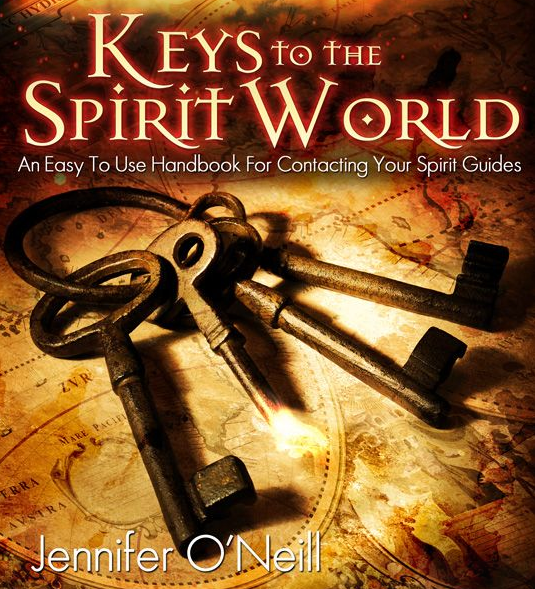 “Keys to the Spirit World” simplifies the process of communicating with your spirit guides, who are always there to help you navigate your path through the physical world. This book helps you use all the spiritual tools and gifts you were born with, but most likely forgot. As a child, you may have heard your spirit guide(s) through your “inner ear,” but blocked them out as you grew older and more conditioned by society’s rules of what is reality and what isn’t. This book is a breath of fresh air, saying “Yes, you can take guidance from your dreams, inner and outer voices, thoughts, and visualizations.” Plus, O’Neill offers guidance on how to relax and allow communication with your spirit guides to happen. She even includes exercises to help you tear down the walls to spirit communication. I especially liked the section on chakras and their correlation to spirit communications. O’Neill explains how chakras, our energetic centers, allow information to be received from the spiritual realm. She takes you one by one through the chakras, with special emphasis on the Heart Chakra, which is elevated and expanded through higher consciousness, the Throat Chakra, used for channeling information during spirit communications, and the Third Eye Chakra, which opens you to clairvoyance and clear seeing. The author shares some of her own experiences as a child growing up with psychic abilities and the sensations she felt in these chakra areas before she understood their relationship to the spiritual realm. And she offers 10 Tips for Working with your Spirit Guides, invaluable for anyone who wants to have a stronger connection to spirit and accept guidance on their path. Have you tried automatic writing, dream journaling or spirit guide meditation? O’Neill offers advice on how to use these tools to connect with your spirit guides. She ends her short yet very comprehensive giude with common blocks to spirit communication and how to solve them. Communicating with Spirit Guides is immensely valuable – this book gives you the tools you need to take advantage of what is offered to each and every one of us from the spiritual realm.